This is the big one. 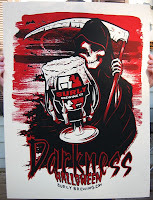 The beer that launched Surly's popularity. Currently ranked 6th on RateBeer's world list. By popular ratings standards, this is the best beer I've ever had. On Surly's D-Day (stolen from history textbooks), a few of these bottles were distributed, but I wasn't lucky enough to get one. Plus, though I'd like to, I couldn't rationalize spending $100 on a six pack anyway. Luckily, Darkness is more commonly found on tap at bars in the Twin Cities, and The Blue Nile was my ticket. It's not hard to find Imperial Stouts these days, and Darkness has similarities to many of them--pitch black color (the name isn't tongue-in-cheek), heavy molasses and burnt caramel smells. You see a glass of this stuff and you've pretty much mapped out your next hour. It's a nightcap. Unlike most stouts, though, Darkness is incredibly drinkable. Almost guzzleable, and dangerously so. If you allowed yourself to, you could pound out a few of these in a three-hour bender, and pay for it in the morning. It's scary good. Darkness doesn't burn your stomach as much as warm it, and the coating of your entire mouth is heavenly. Now, I'm not the biggest Imperial Stout guy in the world, but it's tough to quibble with anything about Darkness. An incredible accomplishment. Screw wine---beer is what we really love. Can't wait to try these!